Larry Sifel died four years ago. But for me, he died today. The thing about people dying is that they are alive until you know they aren’t. Somehow, we figure people remain where we saw them last — waiting for us. The expectation may not be logical, but that doesn’t stop us from having it. So, for me, Larry died today, when I looked him up online and found his eulogy. I knew Larry a long time ago — in college and then on and off for 10 years or so thereafter. 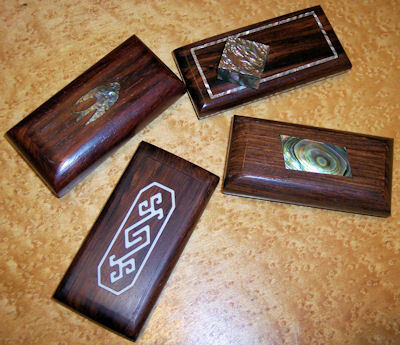 When I first met him, he was making exquisite little rosewood boxes inlaid with mother of pearl, abalone, and bone. Everything was done by hand: precise, intricate shapes painstakingly cut and set in wood, piece by piece, the work so fine you couldn’t see the demarcation between materials. The boxes themselves were satin-smooth, carved from a single piece of wood. When closed, they appeared solid because the work was so precise. I think those early boxes were stash boxes (it was the early 70s so, yes, probably people would have used them to hold their marijuana). Larry’s boxes were so tactile you couldn’t help rubbing them like worry stones. They made you feel tranquil — but of course, a big part of that was Larry himself. His essential goodness infused his work. After college, Larry moved to a more rural area, to a house he helped build (I know this now — I didn’t then). His big love, perhaps even more than the woodworking — was music. He used to host “music festivals” at his place, which was situated on a good sized-piece of land in the middle of the woods. I went to a couple before we lost touch. Basically, friends and family and a lot of local musicians would come and hang out for a long weekend. Bands and individual performers would punctuate the easy camaraderie with music; there was plenty to eat and drink and people would sleep in any clear spot. It was his own little Woodstock. As Larry became more and more involved with music (he was a musician as well as an artisan), he began to make instruments — mainly guitars and banjos. I think the official term is luthier. Naturally, the instruments were embellished with his beautiful inlay. I remember that he was starting to make instruments toward the end of the time we were in touch. That coincided with my work on a set of miniature books for which I decided I wanted a special rosewood clasp. I called Larry and asked him to make the clasps. Of course, he did, although the work must have been really boring. I don’t think Larry said no to his friends very often. On the Pearlworks web site, I found a lot of other information about Larry and his work. He was pretty well-known in music circles and — as it turns out — he also pioneered and patented ways of mechanizing inlay processes that pretty much revolutionized the industry. The instruments he built are cherished by their owners. To possess “a Sifel” is to have something very, very special. For a while, the introduction to the site had a voice-over by Larry and his voice sounded just as I remembered it. I listened to it several times. It was an unexpected and very welcome bit of contact. I’m glad to have known him. I miss knowing he’s part of my world. Boxes by Larry Sifel — early work. The small abalone box measures barely an inch in its largest dimension. Larry said making it was a challenge.